Optimise your organisation's productivity, process and innovation to maintain a competitive advantage in the global economy. 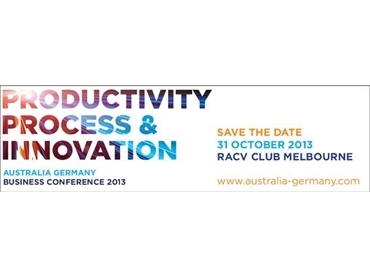 The German-Australian Chamber of Industry and Commerce together with its Partners: German Asia-Pacific Business Association (OAV), the Australian-German Association (AGA) and the Australian Trade Commission (Austrade) will host the Australia Germany Business Conference 2013 - "Productivity, Process and Innovation" on Thursday 31 October 2013 at the RACV City Club in Melbourne, which will be followed by a Gala Dinner. - Take part in exclusive company visits, explore efficient production & logistics processes. The Conference will address key success factors and strategies aimed at global market leadership. Australian and German companies will give valuable insights and share knowledge on how they became market leaders in their field. A selection of outstanding keynote speakers, experienced presenters and panellists will generate discussion and invite you to participate in debate. Registrations will open soon. Submit your expression of interest here.